Organized: Almost everybody claims to be organized. With that in mind, will this make you stand out if you put it on your resume? Probably not. Creative/Strategic: These are “show it, don’t tell it” words. Saying you’re creative and/or strategic means very little, so instead, describe an instance when you came up with a creative project or strategic idea and their results. Motivated/Hard-Working: These are more “show it” words. Your bullets describing projects and experience under your positions should convey these. Responsible for…: Don’t start every bullet with “Responsible for…” There are so many more powerful ways to say this. For example, “Lead…,” “Implemented…,” “Coordinated…,” to name a few. Passionate: This should go without saying. You’re applying to a position within your chosen industry; you should be passionate about the work, so you don’t need to waste the precious space on your resume by saying it. Experienced: Again, your resume itself should speak to this. The hiring manager should be able to see you’re experienced in certain areas, so you don’t need to explicitly write it out. Detail-Oriented: This cliché has lost its meaning, as many job seekers describe themselves as detail-oriented. Find a different way to convey this. Team Player: You might be tempted to use this tired descriptor for team-based positions, but think outside of the box instead. For example, talk about how you and your team excelled in an initiative instead. Expert: Not only is this a cliché, this word should also be avoided because nobody is a true expert in their field. There is always something to learn. Yes, you can have expertize or specialized knowledge on a topic, but saying you’re an expert might cause some eye rolls from your hiring manager. A strong resume does not have clichés. 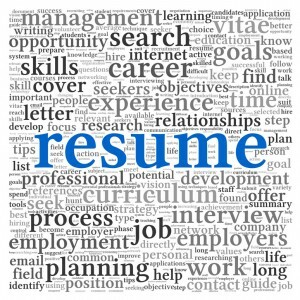 Scour your resume for these overused words and phrases, delete them and make your resume unique to you. Have other words or phrases in mind that need to be deleted? Share them in a comment! This entry was posted in Job Seekers and tagged overused resume words, Resume Advice, resume cliches, resume editing, resume edits. Bookmark the permalink.